As one of the most widely-used services in AWS, CloudFormation continues to expand its feature set by including adding support for Amazon Athena, two new features to protect stacks and control rollback processes, plus several new coverage updates. CloudFormation now supports the creation of an Amazon Athena named query as a resource. Amazon Athena is a query service that makes it easy to analyze data directly from files stored in S3 using standard SQL statements. Named queries can then be executed manually from the AWS Management Console, CLI or programmatically using API calls. 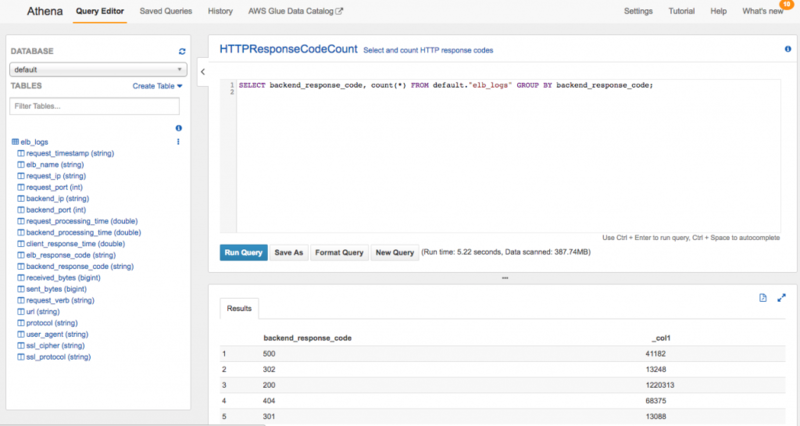 You can now create a standard set of named queries using CloudFormation templates. To try it out, you can use some of the sample data provided by Athena, as covered in Jeff Barr’s blog post here. #           default data set provided by Athena. to demonstrate how to create a named query via a CloudFormation template. Description: "Select and count HTTP response codes"
The Results pane shows that most pages return a HTTP 200 response code, which is good (OK). You can inspect the other error codes, like 404 (Not Found), 302 (Redirect) or 500 (Server Error). Stack termination protection prevents a stack from being accidentally deleted. It’s a property that can be enabled on new or existing stacks, and it provides yet another level of protection for stacks and their resources. This setting is disabled by default, so you have to explicitly enable it when you create new stacks. For existing, non-nested stacks, you can change termination protection using the console or CLI. Rollback triggers allow you to have CloudFormation monitor the state of your application while the stack is being created or updated, and to roll back that create or update operation if the application triggers any alarms you have configured. Chuck Meyer’s blog post here demonstrates the use of rollback triggers. Configure the transfer acceleration state. Update engine property from Oracle-SE or Oracle SE1 to Oracle SE2 without the database instance being replaced. Specify the IDs of the subnets to attach to a load balancer, and specify the type of load balancer to create. For target groups, specify the Availability Zone where the IP address is to be registered, and also specify the registration type of the targets in a given target group. Define lifecycle settings for resources that belong to the application, as well as the service role that Elastic Beanstalk assumes in order to apply lifecycle settings. Specify a custom platform for Elastic Beanstalk. Specify resource tags for a Network Address Translation (NAT) gateway. Specify the stream type, as well as stream and role ARNs for a Kinesis stream used as a source for a delivery stream. Support new properties for input transformation of events, as well as setting Amazon ECS tasks and Kinesis stream targets. Visit our product and documentation pages for more information, as well as our list of supported AWS resources.